The 500 Years Old Shark ! A very, very old Greenland shark was caught by the scientists in the cold depth of the North Atlantic. The scientists tried to determine the age of a few sharks. The study revealed the astonishing fact about that old Greenland shark. It is the time when the Tudors ruled in England. It was the time when Copernicus announced that the earth revolved around the sun. Machiavelli wrote his famous book “Prince” during that time. It was early 16th century, when Ferdinand Magellan decided to navigate around the world. Our Greenland shark was born then, in the cold, dark waters of the North Atlantic. The record of longest living vertebrate was in the name of a bowhead whale. The whale caught near Alaskan coast was approximately 211 years old. The largest land animal, elephant only lives for 80-90 years. But long lifespan is not very uncommon in ocean invertebrates. One clam named “Ming”, an ocean quahog was probably more than 500 years old. Some types of sponges can survive for thousands of years under the ocean! The giant barrel sponges found in the Caribbean has a lifespan of 2000 years! Cinachyra Antarctica, another sponge species found in the Northern Ocean has similar lifespan. Some species of black coral may remain alive for more than 4000 years! If we compare our shark with humans then we can see that it lives more than 5 or 6 times longer than humans. Very rarely some people cross 100 years of age. The longest living human in the records was 122 years old. So, we are not even close to that shark. 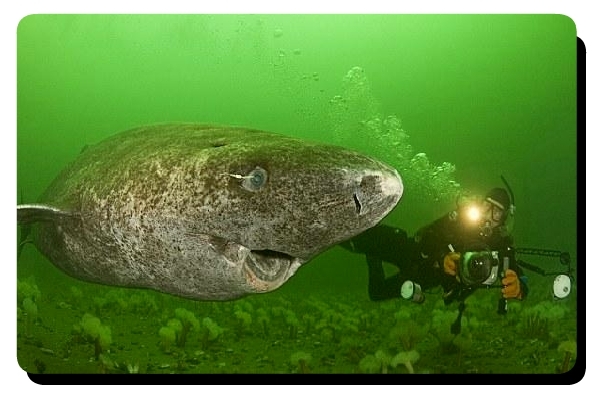 Very little was known about the Greenland shark even a few years ago. 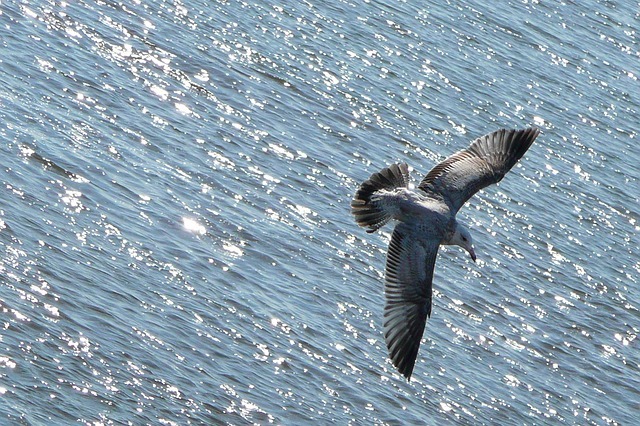 It is because of their habitation. They are the denizens of the very cold waters of the North Atlantic Ocean and the Northern Ocean. They are also mainly bottom dwellers. So, it is very difficult to reach them and it is way too costly. The scientists have discovered that a Greenland shark grows very slowly. The cold, harsh environment is not suitable for energy consuming rapid growth. Its estimated growth rate is about 1cm per year. A female Greenland shark becomes sexually at the age of 156! We should also mention that it is one of the largest sharks in the world. It can be greater than a great white or a tiger shark. Determining the age of a shark is difficult. It is because they do not have otoliths like bony fishes. The “ear stone” or otolith count can reveal the age of a bony fish. So, the scientists decided to examine the eyes of a Greenland shark. Many layers of tissue grow over the eyes of the shark. The scientists removed all the layers to reach the core of the eye. The lens of the eye has the oldest surviving tissue. So, carbon dating tastes were done to find out the age. The result was astonishing. According to them these sharks were aged between 272 to 512 years. Why Greenland Sharks Live So Long? It is difficult to answer why these animals live so long. It can be due to a special gene or hormone. The research is still going on. According to some it is their cold environment which makes them live longer. The environment makes their metabolism very slow. So, the sharks live enjoy a long life span. The right answer can help us humans to enhance our own lifespan by following the shark. 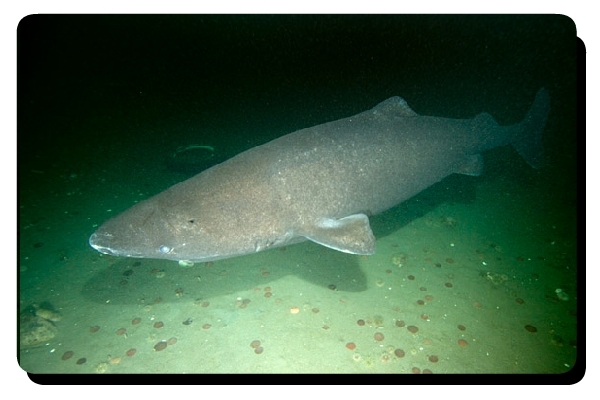 The Greenland shark is in danger due to rapid changes in the Arctic environment. Human activities have made the world a warmer place than before. Rise of global temperature level can kill the shark that survives the onslaught of time for so many years. The Arctic region is now increasingly being exploited for oil and fish resources. It can bring havoc to the ecosystem of the region. So, we must be aware to save that region and the oldest vertebrate of the world. You may also like our other interesting articles about different types of sharks like that about lemon shark facts, porbeagle shark or Port Jackson shark.